We are currently in the thick of pumpkin season and I couldn’t be more excited about it. Most pumpkin recipes are sweet so every once in a while I like to switch things up with a show-stopping savory pumpkin meal. That’s exactly what this Pumpkin Ravioli with Browned Butter Sauce recipe is, and it is bound to become one of your favorite pumpkin recipes. This homemade ravioli is stuffed with a festive pumpkin and ricotta filling. I’ll be honest with you, making homemade ravioli certainly isn’t a weeknight activity. It’s more of a weekend project as it does take quite a bit of time and slightly messy hands-on preparation. Trust me though, it is so worth it and you will absolutely have fun with this scrumptious project. 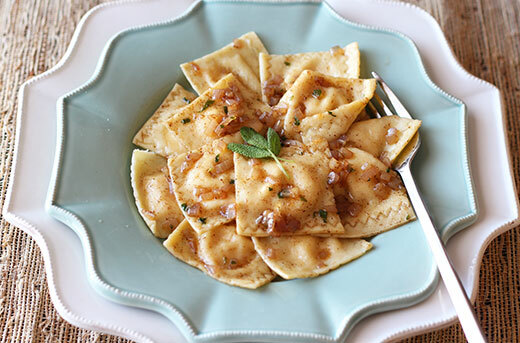 The ravioli is tossed in a decadent browned butter sauce flavored with shallots and fresh sage. If you’ve never had browned butter before you’re totally missing out; it’s got all the wonderful flavors of butter with a slightly nutty, almost caramelized twist. This gourmet recipe will impress all your friends and family, and I’m showing you exactly how it’s made with step-by-step pictures. Let’s get started! First, we need to make the pasta dough. Making fresh pasta seems intimidating, but it really only requires 3 simple ingredients: flour, eggs, and salt. 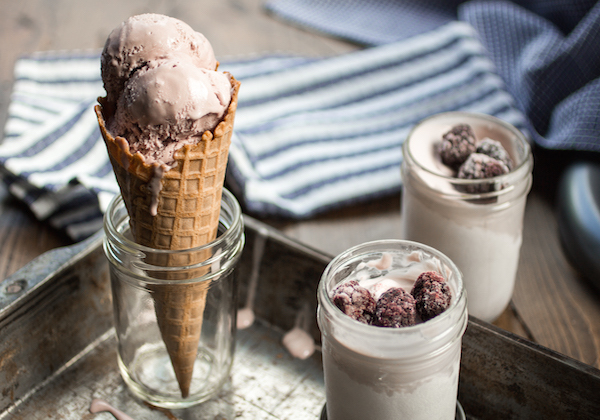 Combine those ingredients in a KitchenAid® Stand Mixer fitted with the flat beater. Mix for thirty seconds on speed two. If it looks extremely dry, add some water one teaspoon at a time. Replace the flat beater with the dough hook and knead on speed two for two minutes. Remove the dough and knead by hand for one to two minutes, until it is smooth, soft, and elastic. Cover the dough well and let it rest for at least 20 minutes or up to 2 hours at room temperature or up to 1 day refrigerated. This rest is important because the dough has just been beaten up pretty good and the gluten needs a chance to relax. If you tried to roll the dough without resting, it’ll likely spring back, shred, or generally resist being rolled. While the dough rests, combine the pumpkin ricotta ravioli filling ingredients. Cover and refrigerate the filling until ready to use, up to 1 day. Divide the dough into four equal pieces, making sure to always keep the dough you aren’t working with well covered so it doesn’t dry out. Attach the KitchenAid® Pasta Roller attachment to your stand mixer. Flatten one piece of pasta dough with your hand and sprinkle each side with a generous amount of flour. Make sure your dough is always coated in flour so it won’t stick to the pasta roller. 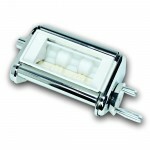 With the pasta roller set to setting #1, turn the stand mixer to speed two and run the pasta dough through the roller. Fold it in half so it is about the same width as the roller and run it through again. Add more flour to both sides of the dough and adjust the roller to setting #2, rolling the pasta through twice. Repeat these steps for setting #3 and #4. Once you have a thin sheet of pasta, place it on a parchment lined baking sheet and cover completely with damp towel until you’re ready to use. Repeat this entire process for the remaining pasta dough. Trim each sheet of dough to uniform rectangles. Attach the KitchenAid® Ravioli Maker to your Stand Mixer. Take one sheet of pasta and fold it in half, sliding the folded end between the two rollers. Rotate the handle with your hand one-quarter turn to feed the sheet through. Open up the two loose ends so they drape over the metal rollers. Click the hopper into place. Use the filling spoon to add the ravioli filling into the hopper, filling the area evenly. Turn the handle to start filling and forming the ravioli, watching the bottom to ensure everything is feeding through properly. Place the filled sheet of ravioli on a floured surface and let it dry for 15 minutes before tearing the individual ravioli along the perforations. If you don’t want to wait, you can also use scissors to snip out the ravioli shapes. The ravioli can now be cooked in a large pot of gently boiling salted water for 3 minutes or made ahead and frozen. Place on a parchment lined baking sheet and freeze until frozen. Remove the frozen ravioli to an airtight container and store in the freezer until ready to use. The ravioli can be boiled from frozen for about 5 to 7 minutes. 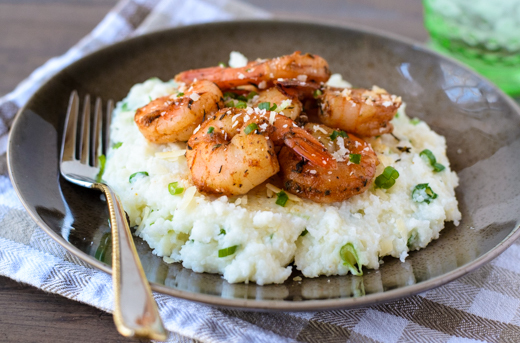 To make the sauce, set a KitchenAid® Tri-Ply Stainless Steel 10-inch Skillet over medium heat and melt the butter. Swirling the pan occasionally, continue to cook the butter. It should become foamy with audible cracking and popping noises. Once the crackling stops, turn the heat to low and add in finely chopped shallot and sage leaves. Continue to swirl the pan until the butter develops a nutty aroma and brown bits start to form at the bottom. Once the bits are amber in color, about 2 to 3 minutes after the popping stops, remove from heat. Don’t let the butter burn! Season to taste with salt and pepper before tossing with the cooked ravioli, there is no straining necessary. Combine the pasta ingredients in the bowl of a KitchenAid® Stand Mixer fitted with the flat beater. Turn to speed 2 and mix for 30 seconds. If it looks very dry, add in water 1 teaspoon at a time. Switch out the flat beater for the dough hook and knead on speed 2 for 2 minutes. Remove the dough and knead by hand for 1 to 2 minutes, or until smooth, soft, and elastic. Cover the dough and let rest for 20 minutes or up to 2 hours at room temperature. The dough can be completely covered and refrigerated for up to 1 day. Once the dough has rested, cut the dough into four pieces, keeping any dough you are not working with well covered so it doesn’t dry out. Attach the KitchenAid® Pasta Roller attachment to your stand mixer. Flatten one piece of dough into a rectangle with your palms and flour each side well. 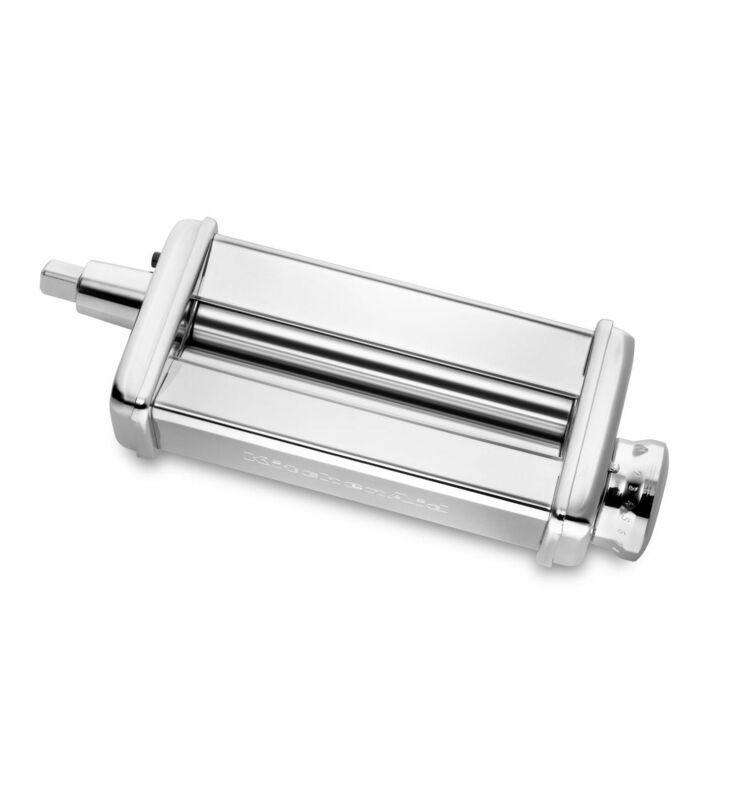 With the pasta roller set to #1, turn on the stand mixer to speed 2 and run the pasta dough through the roller. Fold in half and run it through again. Add more flour to both sides of the dough and adjust the setting to #2, rolling the pasta through twice. Repeat for #3 and #4. Once you have a thin sheet of pasta, place it on a parchment lined baking sheet and cover completely with a damp towel. Repeat the process for the remaining pasta dough. Trim each sheet of dough into uniform rectangles the width the KitchenAid® Ravioli Maker attachment interior. Meanwhile, make the filling. Combine all the filling ingredients in a medium bowl. 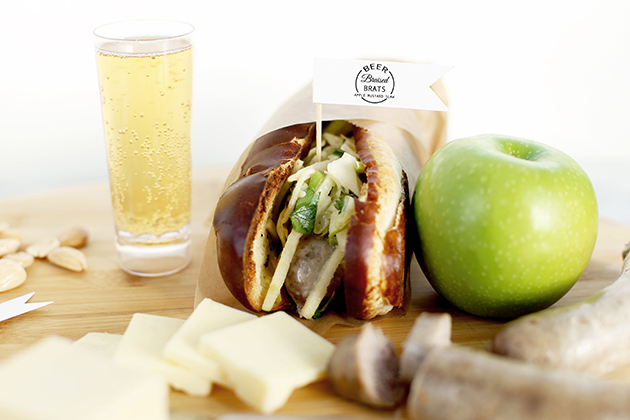 If not using immediately, cover and refrigerate for up to 1 day. 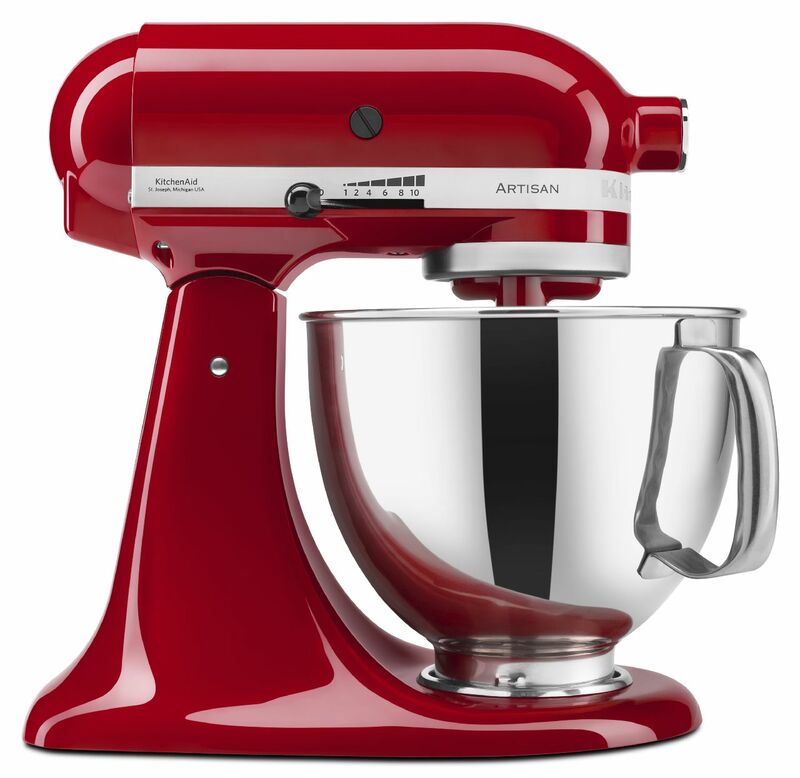 Attach the KitchenAid® Ravioli Maker to the Stand Mixer. Fold a sheet of pasta in half and slide the folded end in between the forming rollers. Rotate the handle one-quarter turn to feed the sheet into the maker. Pull the two loose ends of the sheet apart and drape each end out and over the smooth metal rollers. Place the hopper on top of the sheets of dough between the loose ends and push down until you hear a clicking sound. Add ravioli filling into the hopper with the filling spoon, filling the entire area in evenly. Turn the handle to make the ravioli, watching the bottom to ensure the finished ravioli sheets are feeding through properly. Leave the finished sheets for 15 minutes to dry and rest. Tear off individual ravioli along the perforations. Bring a KitchenAid® Tri-Ply Stainless Steel 8-Quart Stockpot full of salted water to a gentle boil. Boil the fresh ravioli for about 3 minutes (boil for 5 to 7 minutes if frozen). Drain and set aside while making the sauce. 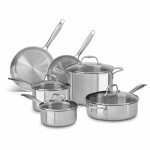 In a KitchenAid® Tri-Ply Stainless Steel 10-inch Skillet set over medium heat, melt the butter. Swirling the pan occasionally, continue to cook the butter. It should become foamy with audible cracking and popping noises. Once the crackling stops, turn the heat to low and add in the shallot and sage leaves and continue to swirl the pan until the butter develops a nutty aroma and brown bits start to form at the bottom. Once the bits are amber in color, about 2 to 3 minutes after the popping stops, remove from heat. Don’t let the butter burn! Season to taste with salt and pepper. Toss in the cooked ravioli. Divide among 4 serving dishes and garnish with additional sage leaves, if desired. Serve hot.